In July 2015, the United States government invited Drew Harvell, a marine ecologist at Cornell University in New York, to SeaSick, a congressional briefing organized in the wake of devastating disease outbreaks in sea stars, corals, oysters, and lobsters. Along with three colleagues and Communication Partnership for Science and the Sea, Harvell briefed members of Congress on the growing threats of disease in coastal waters, emphasizing how outbreaks had economic consequences. The questions from lawmakers revealed a serious information gap to the scientists. Those from ocean states were aware of some problems, such as overfishing, agricultural runoff, and plastic pollution. But few were aware of the rolling tide of new disease outbreaks affecting marine organisms around the world. They didn’t know that warmer and more polluted ocean waters are allowing infectious pathogens to thrive while simultaneously weakening marine creatures’ abilities to withstand disease. Nor did legislators know that new scientific discoveries can improve the management of marine disease. Alarmed, Harvell decided to write a book about her experiences with four recent and serious disease outbreaks to explain the threat and motivate others to take action. This is an excerpt from Ocean Outbreak. In the mid-1980s, Brian Tissot was a graduate student studying black abalone on two islands off the California coast south of San Francisco. He was a dedicated surfer, diver, and adventurer, and looked the part—a bearded, tanned, 1980s surfer dude. 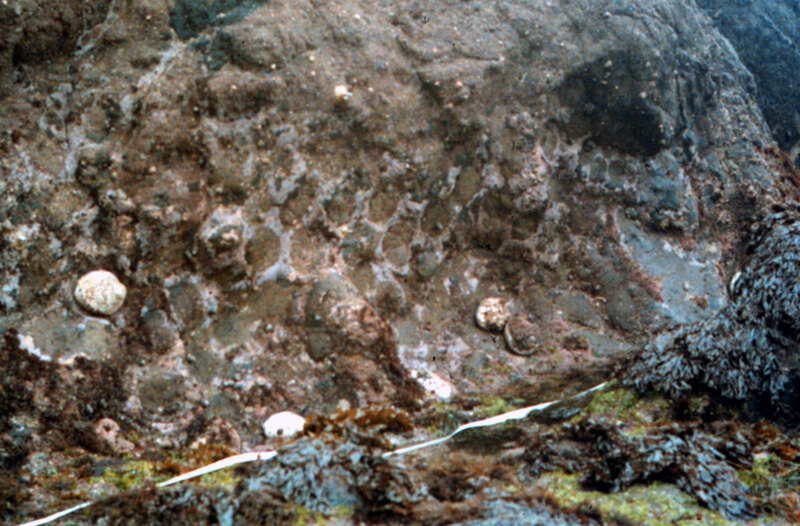 The initial goal of Tissot’s abalone study was to understand how the shape and size of black abalone shells varied among populations along the west coast. He had noticed that abalone differed in shell shape and in the number or form of respiratory holes, and he wanted to understand how wave exposure, growth rate, or type of food affected those characteristics. To do that, he needed to tally the numbers of different shell shapes and sizes. 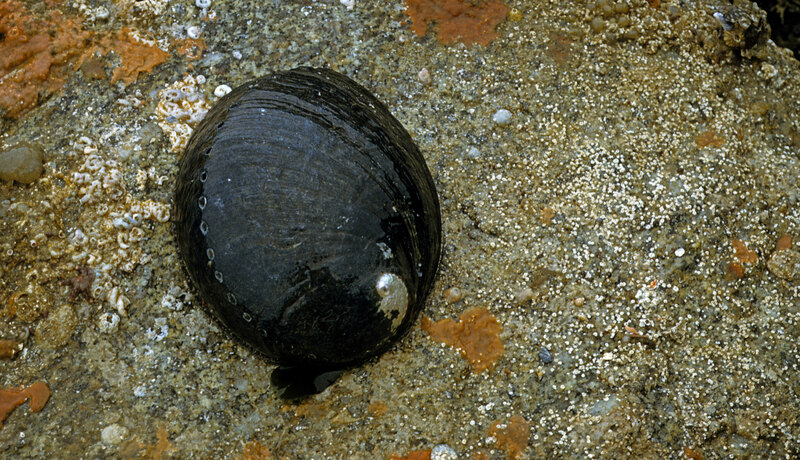 Black abalone are the only California species that live in the intertidal zone, which made his study on Santa Cruz and Año Nuevo Islands slightly safer. Tissot could gather data without having to dive in the shark-rich waters near the islands, and where most shark attacks occur in California. When Tissot started his intertidal surveys, the abalone at Santa Cruz Island were so dense they piled one on top of the other, so he had plenty of study animals. 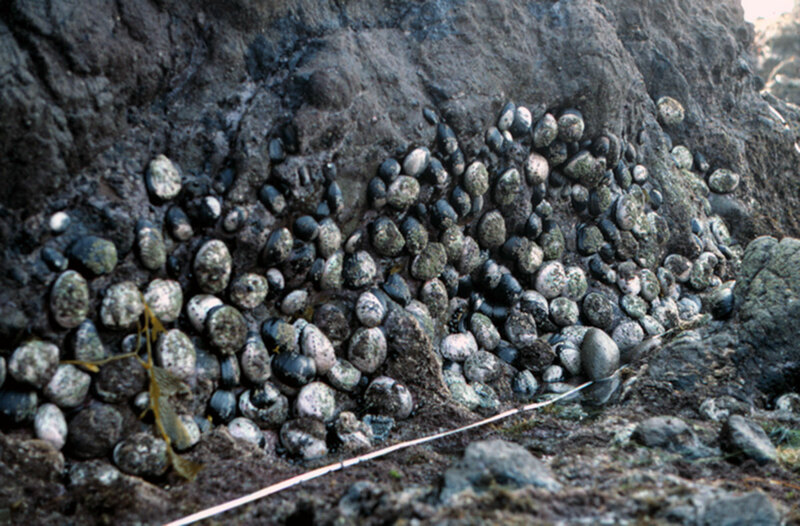 He would stretch his transect tapes across the rocks and count every abalone, and its size and shape, near the line. 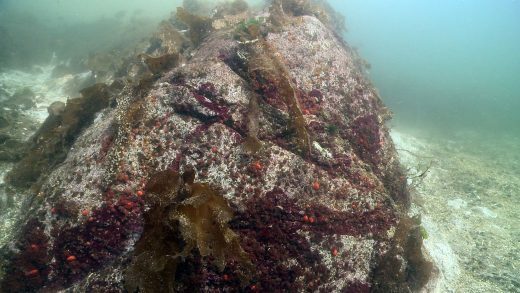 Intertidal surveys may sound like a breeze, but these offshore islands are remote, treacherous, and wave-bashed. Many of Tissot’s transects were located on cliff edges. The black abalone were so dense on Tissot’s eight transects on Santa Cruz Island that in the beginning, it took him three days to count them all. But then on one trip in 1988, when he returned after being delayed by a big winter storm, he was surprised to see open space and many empty scars in the rock on some of his transects. A lot of abalone had suddenly disappeared, and he did not know why. Our oceans and the life forms they support are under siege, threatened by a formidable collection of forces that cause both sudden mass mortalities and a slow degradation of biodiversity. The top threats are the warming and acidification that accompany climate change, overfishing, pollution from human activities on land, nearshore dredging, and oil extraction. Faced with such a ponderous list, it is hard to prioritize. As a marine ecologist specializing in disease, I worry most about the threat posed by microbes, because in oceans beset by all these stresses, microscopic disease-causing organisms can gain the upper hand, cause death on a massive scale, and thereby bring about rapid, wide-scale ecological change. Microbes are scary in part because they are changeable and not under our control. Pathogenic organisms in the microbe category—viruses, bacteria, fungi, protozoans, and other disease-causing agents that don’t fit neatly into these groups—are constantly evolving, their genetic codes often changing rapidly and staying one step ahead of their hosts’ defenses. Think about one of the deadliest of human diseases, the Ebola virus, which causes fever, severe headache, vomiting, diarrhea, and hemorrhagic bleeding in its victims. Available evidence indicates that the virus has existed in bats in Africa for a long time, occasionally jumping to human beings but never breaking out beyond Africa. Then in 2013 a horrific epidemic of Ebola virus started in Guinea, Liberia, and Sierra Leone, spreading faster and farther in Africa than previous outbreaks. Declared a Health Emergency of Special Concern [by the World Health Organization] in August 2014, the virus ultimately killed over 11,000 people and reached Europe and North America. Why was this outbreak so much bigger than earlier ones? Scientists aren’t sure, but one hypothesis, backed up by intensive study, is that a key mutation allowed it to become more transmissible among humans. Because viruses have a very short life span and so many new virus particles are produced in the body of a single host, there is ample opportunity for such mutations to occur. Microbes are dangerous too, because many can attack and infect more than one species or spontaneously develop that ability through a favorable genetic mutation. Pathogens that have a wide host range, called multi-host pathogens, tend to be deadly for at least some of the species they can infect. By deadly I mean they can kill every individual within a susceptible species, even driving them to extinction, while persisting in a more resistant host species. Contagious individuals in a resistant species can keep exposing healthy individuals in a susceptible species until the susceptible species is wiped out. In these situations, we say that the pathogen has a reservoir in the resistant hosts—a nice comfortable hideout from which to spread. 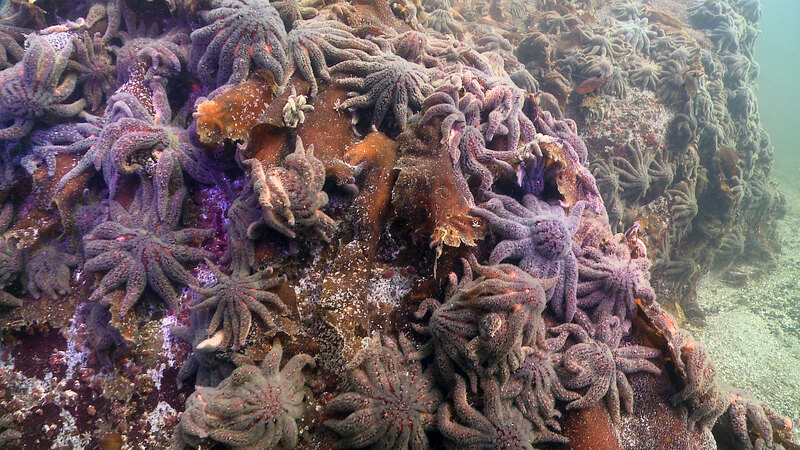 The sea star wasting epidemic of 2013–14 was caused by a multi-host pathogen. It affected almost all the major species of sea stars. Those of us who study non-human diseases are very concerned that mass mortality caused by multi-host pathogens is becoming a common and recurrent event, threatening biodiversity in both terrestrial and marine environments. In 1989, a few years into the abalone decline, Carolyn Friedman, now a professor at the University of Washington, was then a young biologist newly hired as a fisheries pathologist by the California State Department of Fish and Game. She was assigned the task of figuring out why abalone were dying. It was hard to know where to look for causes of the unusual mortality, since there was no baseline of abalone health nor previous images of their tissues. Friedman started by running the same kinds of analysis on sick and dying abalone that human pathologists run on sick and dying humans. She noticed the same thing that Tissot did: the feet of abalone were losing tone and mass, then they fell off the rocks and died. Friedman wanted to know what was happening inside the sick abalone. She dissected the animals and checked the health of each internal organ. Friedman published a paper in 2000 with clear evidence that the infectious agent was Withering Syndrome (WS), a rickettsia-like organism that infects abalone gastrointestinal tissue. (Rickettsia is a group of small bacteria.) She named the pathogen Candidatus Xenohaliotis californiensis. This sneaky parasite slowly disabled the digestive tissues of the infected abalone, starving it and causing the foot to wither. Fast-acting virulent diseases—like our sea star killer—are scary to watch since prime-of-life animals can suddenly be killed in large numbers. But slowly incubating diseases like abalone WS are just as scary, and their causes can be even more difficult to identify. An example of a slow-rolling human disease is Creutzfeldt-Jakob prion disease, a rare and fatal brain disorder linked with bovine spongiform encephalopathy, or mad cow disease. A prion, a misfolded protein particle, most likely causes Creutzfeldt-Jakob disease; people who develop the disease are exposed by eating food contaminated by infected cattle brain or other central nervous system tissue. Pinning down the disease has been difficult since it may take 10 years for symptoms to appear. Scientists identified the causal agent of abalone as WS, but it is unusual among bacteria and we don’t know very much about it. On land, rickettsial bacteria are never free-living and can survive only inside the cells of a host. Scientists call them obligate intracellular parasites. They are always transmitted by a bite from an insect vector like a tick or a mite. The rickettsial bacteria also cause diseases in terrestrial animals, Rocky Mountain spotted fever and typhus. It is tricky to confirm a disease caused by rickettsia since they hide inside cells and are undetectable by a simple blood test. Given that rickettsial bacteria are intracellular and on land require a vector—the insect—to move among hosts, how marine rickettsia spread among abalone was a puzzle. Friedman explained to me what she has figured out: since seawater has essentially the same salinity as abalone blood, the bacterium can survive briefly outside a host and then transmitted in seawater. She and her student Lisa Crosson tested infectivity and found that the rickettsia remains viable in seawater for at least 24 hours. It is extraordinary that this rickettsial bacterium deviates from the normal transmission biology of requiring a vector on land. Direct transmission in seawater is much faster than via a vector. This is a striking example of why we have more problems with disease transmission in the sea than on land. Seawater aids the survival and the spread of pathogens, while air does not. Imagine if the diseases such as dengue or malaria, both of which require vectors like mosquitoes, could be transmitted directly, spreading freely in the air: it would be impossible to control these diseases. We would be in big trouble. The abalone are in big trouble too—but maybe the situation is not hopeless. In 2002, something unexpected began happening with the abalone in the Channel Islands. Glenn VanBlaricom, a researcher at the University of Washington, noticed that some black abalone were surviving at one site on the remote San Nicolas Islands, about 100 kilometers off the California coast. It seemed that these abalone might be resistant to WS. Friedman had wanted to test if this was true so they worked with VanBlaricom to collect young abalone from the island and from the mainland at a site without the disease, in Carmel, California. Friedman and Crosson then ran another long-term experiment. They found that when exposed to the rickettsia, the San Nicolas abalone survived longer and in greater numbers than abalone that had never been exposed to the disease. This was an exciting find; some abalone now appeared resistant to the rickettsia. Years of experiments later, in 2014, Crosson and Friedman concluded that the San Nicolas black abalone were in fact becoming more resistant than abalone from the central California coast. It appeared that some San Nicolas individuals had a genetic variation that gave them increased resistance, and through natural selection these survivors were producing similarly resistant offspring. But there was an added twist. When the two scientists double-checked microscope slides from their newer experiments to be sure the abalone were truly infected, they were puzzled at what they saw. The abalone still had large purple inclusions, showing the actual rickettsia in their digestive systems, but there was something extra in the pictures of their intestines: big dark blue inclusions. Friedman had seen something like this before and thought a new parasite had entered the picture. When she used an electron microscope to look at these inclusions, she saw that the rickettsia had themselves been infected—by a virus. Viruses that infect bacteria are called phages. The abalone were developing resistance through natural selection and a phage was disrupting the pathogenicity of the rickettsia, basically augmenting the abalone’s disease resistance. This was welcome news, but it introduced a new puzzle: where did the phage come from? How the phage and the bacteria arrived in California will likely remain a mystery. Perhaps the phage was introduced with the rickettsia and then evolved so it could infect the rickettsia and slow the progression of this disease. Or the rickettsia were introduced to California without the phage in the early 1980s via infected abalone from somewhere else. Once the pathogen appeared on the California coast it survived well enough to spread, probably helped along by the 1982–83 El Niño. Then, years later, the phage materialized. The phage now appears to have spread throughout much of California where abalone are found. Even though the resistance among surviving abalone and the spread of the rickettsia-infecting phage may give abalone populations a chance to recover over time, the rickettsial bacteria have a powerful ally: climate change. Circumstantial evidence points to the possibility that a warming ocean environment fueled the outbreak and continues to benefit the rickettsia. Tissot, now director of the Humboldt Marine & Coastal Sciences Institute in Humboldt, California, noted a warm water trend and a black abalone die-off on the California mainland in the early 1980s. Half the abalone in his study died when temperatures rose above 26 °C. “Which made sense,” Tissot told me. “They are big, black animals exposed in the intertidal zone at low tide.” Later thermal studies during the 1988–89 El Niño also showed a 50 percent loss of black abalone at Diablo Canyon—but at 18 to 20 °C. 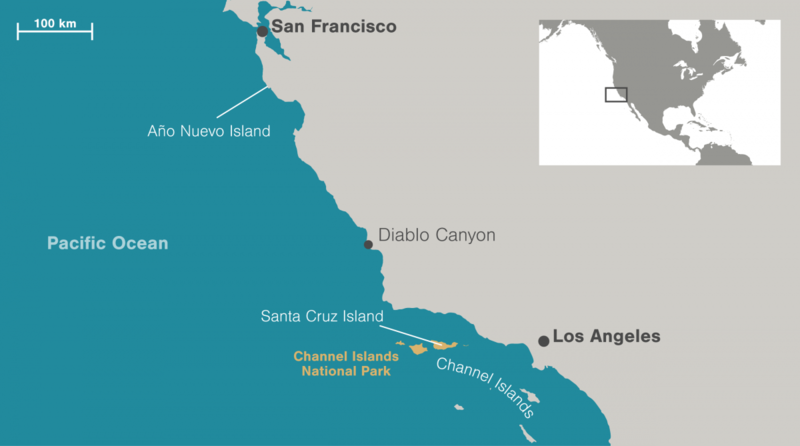 The first place WS came ashore after the Channel Islands, was at Diablo Canyon in 1988. The thermal studies combined with the fact that the outbreak coincided with El Niño–associated warm-water conditions, and five subsequent studies, supports the hypothesis that warm temperature fuels the epidemic. 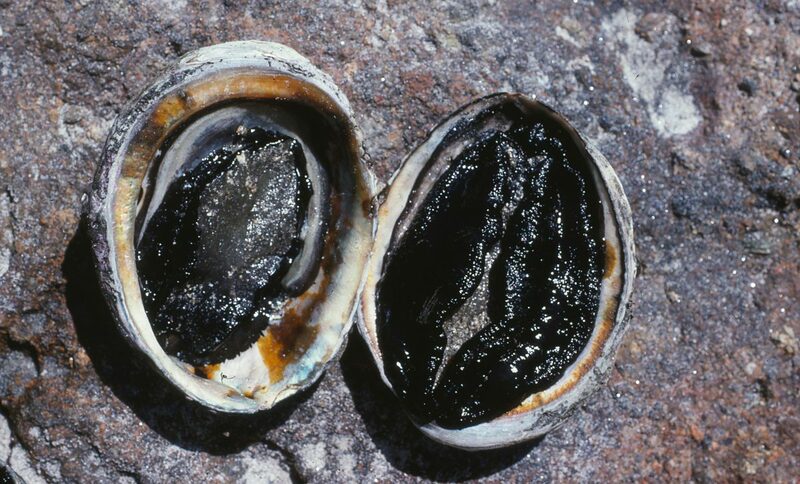 In 2009, the government listed black abalone as endangered. They are considered locally extinct at most mainland sites south of Point Conception, California. The continued presence of the rickettsia that causes WS in California waters impedes abalone recovery. The only hope right now, for black abalone, is the rickettsia-infecting phage and the existence of resistant individuals. From Ocean Outbreak by Drew Harvell, published by University of California Press. Copyright © 2019 by Drew Harvell. 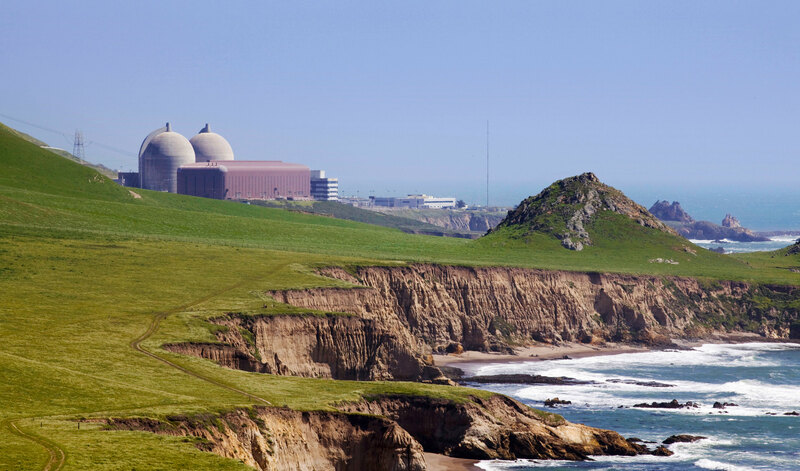 Correction: This article has been updated to clarify that the thermal studies at Diablo Canyon were conducted by John Steinbeck for an environmental consulting group, not by Brian Tissot. Drew Harvell is a professor of ecology and evolutionary biology at Cornell University in New York. 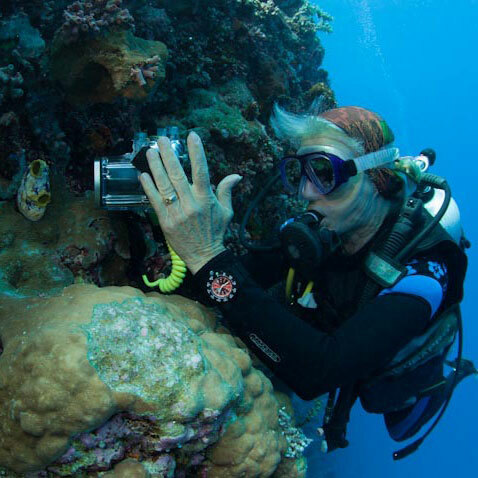 Her research on the health and sustainability of marine ecosystems has taken her from the reefs of Mexico, Indonesia, and Hawai‘i to the cold waters of the northwest Pacific and resulted in over 170 academic articles in journals such as Science, Nature, and Ecology. Her 2016 book, A Sea of Glass, won the National Outdoor Book Award and Honorable Mention Rachel Carson Award. Cite this Article: Drew Harvell “Tiny Monsters in the Sea,” Hakai Magazine, Apr 9, 2019, accessed April 23rd, 2019, https://www.hakaimagazine.com/features/tiny-monsters-in-the-sea/.